Dubbed as ‘The City of Dreams’, Mumbai or formerly Bombay as it is still fondly referred to has been rated as one of the Places of a Lifetime by National Geographic’s Traveler magazine. A melting pot of religions, customs, people and culture, it can be described as a place where traditional meets the modern in extremes. India’s economic powerhouse, Mumbai is the county’s most cosmopolitan metropolis. The city is said to have more millionaires per square mile than Manhattan in the United States but at the same time also has the distinction of housing Asia’s largest slum. Walking down the streets of this city is like an assault on all the senses. You will notice the sharp contrasts like business tycoons driving past thousands of poverty stricken people barely making a living, in their swanky imported cars and posh hotels, restaurants, branded stores overlooking rickety chai stalls and roadside vendors. If there’s a city that stirs the soul and fires the imagination like no other, it’s Mumbai. Love it or Hate it, Mumbai is a must see place for all and if you happen to visit here are some of the places you have to visit to capture the essence of this city. One of the most recognizable monuments of India after the Taj Mahal, the Gateway of India was built to commemorate the visit of King George V and Queen Mary to Bombay in 1911. The Gateway also became a sort of epitaph as the last of the British ships set sail for England from the Gateway, after the British Colonial Rule in India ended in 1947. Today it the Gateway of India is starting point for most tourists who want to explore the city. You will find an almost carnival like atmosphere with street vendors, touts and magicians around this grand old monument as it draws thousands of tourists everyday from within India and around the world. Not to mention it is also a hot favorite spot for Mumbai residents themselves and considering the city holds a population of over 13 million- it can get very crowded at times. From the wharf beside the Gateway of India, boats cast off every half-hour for Elephanta Island also called Elphanta Caves in Mumbai Harbor. The hour’s journey itself is half the thrill with the cool breeze and Mumbai skyline view. A UNESCO World Heritage Site, Elephanta is famous for its ornate cave temples and devotional carvings, hewn from basalt rock some 15 centuries ago between 450 – 750 AD. 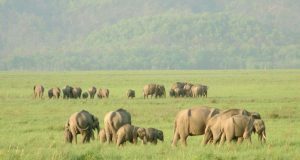 The island was original known as Gharapuri but was renamed by the Portuguese, who named the island after a stone elephant that was found on the shore. This elephant is no longer on the Island. One word of caution though while visiting Elephanta Island, keep an eye out for cunning and sometimes brash monkeys that are residents here…hold on to your camera and watch your belongings. The Haji Ali Dargah is a picturesquely situated mosque and Islamic shrine dedicated to the Muslim saint, Haji Ali, on an islet in Worli in South Mumbai. The dargah or tomb is one of the most recognizable landmarks in the heart of the city. One of India’s main art galleries displays changing exhibits by well-known Indian artists in its four exhibition halls. A terrific place to feast your eyes on fine Indian art, it is the uncrowned Mecca of Art in Mumbai and is located at Kalaghoda behind the Prince of Wales Museum. The complex also has the popular cafe of Samovar, which is reminiscent of the 70’s socialist culture. There’s plenty of art to be seen outside as well, as the plaza in front of the building is full of artists offering their works for sale and their talents for commission assignments. The Prince of Wales Museum now known as Chhatrapati Shivaji Maharaj Vastu Sangrahalaya is Mumbai’s largest museum. The museum building is built in the Indo-Saracenic style of architecture, primarily, incorporating elements of other styles of architecture like the Mughal, Maratha and Jain resulting in a rather unique structure crowned by a sparkling white dome. Filled with an excellent array of items from around the country some of the exhibits include old sculptures, exquisite Mughal paintings, handcrafted armaments, and rare artifacts from the Indus Valley. It also boasts of some priceless Tibetan and Nepali Art like Buddhist tankha scrolls and Tibetan bronzes, but the chief attraction here is the collection of over 2000 miniature paintings from the various art schools of India. 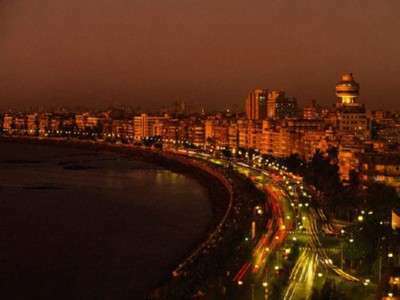 Dubbed the ‘Queen’s Necklace’ as it lights up at night with it’s street lights resembling a string of pearls, the Marine Drive boulevard in South Mumbai is 3-kilometre-long ‘C’ shaped road along the coast, which is a natural bay. It features a windswept promenade, flanked by the sea and a row of art deco buildings which have some of the highest real estate prices in the World! It is home a number of celebrities and most of the top-notch 5 Star Hotels are located in this area. This is where most of south Mumbai comes to breathe in some fresh air and is a great place to see in the evenings. To truly experience the other side of Mumbai and its worker class, visit the massive open-air laundry in Mahalaxmi, where thousands of dhobi-wallahs or washer-people clean dirty clothes and linen. Almost two hundred dhobis (washers) and their families work together in what has always been a hereditary occupation where they collect your dirty linen from your doorstep, wash it, and return it neatly pressed back to your home, all for a very low price. There are row upon row of open-air concrete wash pens, each fitted with its own flogging stone. The clothes are soaked in sudsy water, thrashed on the flogging stones, then tossed into huge vats of boiling starch and hung out to dry. They are then ironed and piled into neat bundles. You would never imagine that clothes are clean in a place that looks as dirty as it, but amazingly enough people this is how across the huge city of Mumbai people get their laundry done. Perched at the top of Malabar Hill, Hanging Gardens or the Ferozeshah Mehta Gardens are a breath of fresh air with it’s greenery in an otherwise concrete jungle that is Mumbai. The park was laid out in the early 1880s over Bombay’s main reservoir. It is a great point to view sunsets over the Arabian Sea and it features numerous hedges carved into the shapes of animals. Hanging gardens is nice park to visit to soothe your eyes with some greenery and visit on during an evening in the city. Juhu, a suburban neighborhood of western Mumbai is famous for its sprawling beach, the Juhu Beach. It is one of the more affluent areas of Mumbai and houses a lot of celebrities and Bollywood stars. Famous for its Mumbai street food (although not very hygienic), notably bhelpuri, pani puri, chaats, and of course pav bhaji, it is a popular gathering place during and after sunset for locals and tourists alike. 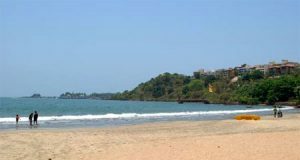 It can get very crowded on weekends and is not the most relaxing of beaches so if you want a little fancy excursion, retreat behind Juhu’s many five star hotels and cafes, for a steaming cup of coffee and a splendid view of the coast. Wow, wonderful weblog structure! How long have you ever been blogging for? you make running a blog glance easy. The entire look of your site is excellent, as neatly as the content material!